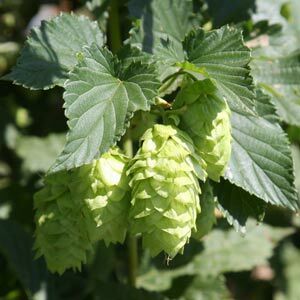 Humulus lupulus is the common ‘Hop Plant’ it is a climbing plant that can be grown from seeds but more easily from seedling or tube stock plants if you can find them for sale. It is the flower cone from the female plant that is used to make beer. However it is an attractive plant in itself with interesting flowers. In beer making the hop gives flavour as well giving the beer stability. They balance the sweetness of the malt sugars and also act as a preservative. It is only the un pollinated female flowers that are used in brewing. In the garden they are a fast growing plant that will provide a green backdrop as well as shade in summer. Hopes are grown from rhizomes and as they are a climbing plant they are best grown on a trellis. The Hop plant, Humulus lupulus can reach around 1.5 – 2m. A frost free, sunny potion with some protection from the hot afternoon sun in warmer climates, in a humus rich soil is best. They will self seed if allowed. Mulch around the plant to retain moisture and water well during dry periods over summer. Hop plants are sold as potted plants from spring to early summer and as dormant, bare rooted crowns in autumn. These are a climbing plant so they will need a trellis or fence to grow on. Prepare the soil well before planting, weed the area and dig in compost and well rotted cow manure. Put the trellis in place. Harvest time is in the autumn. Hop plants are either classified as ‘bittering’ or ‘aroma’ types. Beer makers will have favourites and combinations. These are then divided into ‘Noble Hops’, English Hops’ and ‘American Hops’.